Bathing your dog on a regular basis will help keep his coat and skin healthy. If you like to keep your dog looking his best but don't want to pay hundreds of dollars each year in professional groomer fees, have no fear! It may be easier than you think to learn a few simple grooming and bathing techniques that you can use at home. Brushing your dog's coat on a daily basis is very important in controlling shedding. When brushing your dog, always brush in the direction of hair growth, starting at the head and moving down the neck, along the back and then down the legs. For dogs with short or coarse coats, use a bristle brush with closely-spaced bristles -- dogs having longer coats may require a brush with more widely-spaced bristles. If your dog has medium to long hair or if he has a curly coat, a wire-pin brush may be a better option. Slicker brushes can be used on any dog to remove mats, though the size of the brush should be determined by the size of the dog. Learning to trim your dog's coat can be tricky because the coats of different breeds grow in different ways. The best way to learn how to trim the coat of your particular breed is to ask your groomer to show you how he does it. In many cases, trimming a dog's fur requires the use of both sheers and electric clippers. Use the sheers to carefully trim the fur around your dog's eyes, ears and feet. The clippers can be used to trim the hair on your dog's legs, back and stomach -- the blade you select for the clippers will determine the length of the hair. If it isn't already, cleaning your dog's ears should become part of your regular grooming routine. Though breeds with ears that stand erect are less prone to developing ear infections, dogs with long or floppy ears require frequent cleanings to keep the ears from getting too moist and harboring infectious bacteria. To clean your dog's ears properly, squeeze a few drops of dog ear-cleaning solution into the ear canal, then massage the base of the ear to distribute the solution. Wipe away any wax or discharge with a clean cotton ball and be sure to remove any excess cleaning solution from the ear as well. Clean your dog's ears on a weekly basis to prevent infection and avoid getting the ears wet during bathing. When you don't know what you're doing, it can be very dangerous to clip your dog's toenails. If you look closely at your dog's nails you may be able to see a darker area near the base of the nail -- this is the quick, the blood supply for the nail. It is possible to cut the quick if you are inexperienced in cutting your dog's nails and, if you do so, it could result in pain and excessive bleeding. Before you begin clipping, ask your veterinarian or a professional groomer to show you how and be sure to use nail clippers designed specifically for dogs. Even after you learn the proper procedure it is wise to keep some clotting powder on hand to stop the bleeding in case you do cut the quick. Bathing your dog regularly will help keep his skin and coat healthy, but bathing him too frequently could dry out his skin, causing itching and irritation. The frequency with which you bathe your dog will depend on his coat length and type as well as his activity level -- dogs that spend a lot of time outdoors tend to get dirtier, and long or curly coats may require more frequent bathing to prevent tangles. When bathing your dog, always use lukewarm water and specialized dog shampoo. 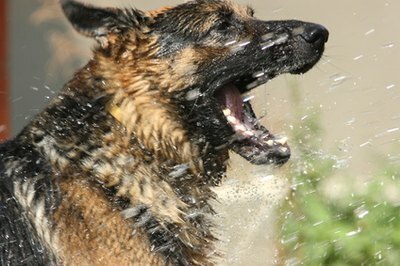 Human shampoos often contain dyes and perfumes that can irritate your dog's skin. During the bath, be sure to avoid getting your dog's ears and eyes wet because excess moisture in these areas can lead to infection.